To ensure smooth operations, it is essential for every business to possess some form of scheduling method for their shifts. Payboy has designed a user-friendly and powerful rostering system for its users. Head to Employees > Schedule Shifts on the side menu. Select the Date of this shift , Enter the Start time and End time. Scheduled shifts are not visible on the employee dashboard yet. You have to publish it in order for them to bid for the scheduled shifts. 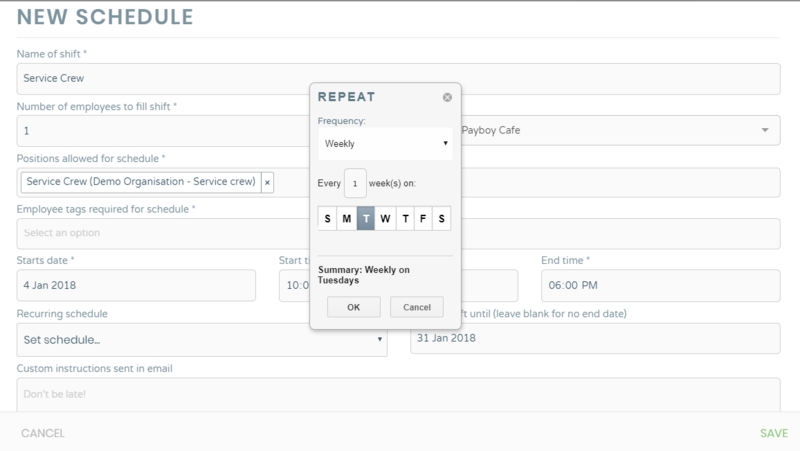 Scenario 1A depicts the time when you are scheduling a new part-time shift which needs 2 people and this shift will be held for 5 working days (Monday to Friday). Select Set schedule… for the Recurring schedule. Follow the records below, and click OK once you are done. Click on Do recurrence until, select 31 Jan 2017 (or 3 days after the date you have selected). Click Save to schedule this new shift. The boxes with the Name of shift will appear on the Calendar below its date. Scenario 1B is almost the same as 1A, except that the recurrence takes place on the alternate days of Monday to Friday. 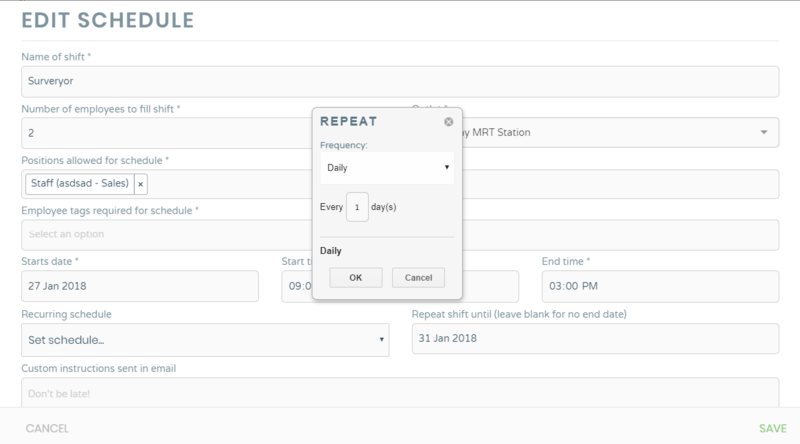 Click on Recurring schedule, a drop-down list will appear. Click Save. The shift will appear at the calendar on the alternate day which are Monday, Wednesday, and Friday. Scenario 2A depicts a scenario where an employee will only work once per week. Follow the above guide on how to schedule a new shift. Click on Do recurrence until, select 31 Jul 2018 (or end of the month). Click Save to schedule this new shift. The shift will appear at the bottom of the calendar. 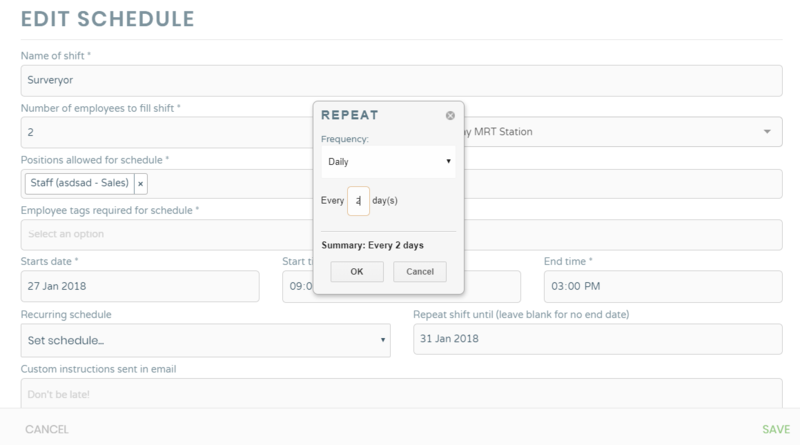 As mentioned previously, the administrator has to publish the scheduled shifts before the allocated employees are able to see it on their interfaces. Select the day and locate the shift that you are looking for at the bottom of the calendar. Click the Green Arrow button which is located on the bottom-right hand corner of the shift. Once clicked a you will see Shift Published in green. Also, Acknowledge and Scheduled will appear in the shifts. In case the administrator makes an error and publishes an incorrect lift, here are the ways he or she can rectify the oversight. Administrator allocates different groups of employees into the shifts based on their position. For this article, we will be focusing on the role of the administrator. Click on Positions allowed for schedule and select the positions from the drop-down list. Click Save and the changes will be made. This can be seen from the Positions Needed column. Once your employees have bid for the published and the shifts have turned green (as mention in the section above), these shifts are ready to be finalized. Do note that this will only be possible after employees are assigned to the published shift. On the calendar the Slots Filled will change from 0 to according to what has been finalized. Important note: Once the shift is finalized, you will not be able to change any details of that shift. However, you can change it by clicking on the unpublish shift button and then proceeding to modify it.